Founded in 1852, Wells Fargo is the fourth-largest U.S. bank with assets totaling $1.75 trillion, according to SNL Financial. Wells Fargo provides consumer, investment and corporate banking, credit cards, financial services, foreign currency exchange, private banking and equity, wealth management and mortgages. It is considered one of the “Big Four Banks,” along with JPMorgan Chase, Bank of America and Citigroup. Wells Fargo is headquartered in San Francisco, and the majority of the company is owned by institutional holdings. Berkshire Hathaway Inc. (Warren Buffett’s company) is the No. 1 owner of those shares. In 2014, it was named as the No. 1 retail mortgage lender and mortgage servicer by Inside Mortgage Finance. That year it was the largest mortgage originator and residential mortgage servicer in the country. In 2011, it provided the mortgage for one in every four home loans. According to data from the Consumer Financial Protection Bureau, Wells Fargo’s total loan volume in 2015 was an astounding $140,140,955,000. Does Wells Fargo Operate in My Area? Wells Fargo offers loans in all 50 states and has over 8,600 physical locations with 1,200 locations offering mortgages. The bank does business with 70 million customers and has roughly 269,000 employees according to the Wells Fargo Today 2016 fourth quarter fact sheet. What Kind of Mortgage Can I Get With Wells Fargo? Fixed-rate mortgage: The interest rate doesn’t change for the entire life of this loan, which means your monthly payments won’t change either. This popular mortgage option is available in 15-year or 30-year terms and is often the choice for buyers who plan to stay in their homes for a long time. Federal Housing Administration (FHA) loan: Compared to a conventional loan, this mortgage has more flexible lending requirements like lower credit scores and down payments as low as 3.5%. As a result, your interest rate may be higher. FHA loans are available in a number of fixed-rate or adjustable-rate options. This loan is backed by the government. VA loan: If you are a current or former member of the U.S. military or National Guard, you may be eligible for this mortgage which is backed by the Department of Veterans Affairs. Some benefits include low or no down payment costs, no mortgage insurance premiums required and a simplified approval process. You may have to pay a one-time VA funding fee which can be financed into your loan amount. VA loans are available in a variety of fixed-rate or adjustable-rate loan options. Jumbo loan: This type of loan exceeds the conforming loan limit of $424,100 in most of the U.S. If you are buying in some high-cost areas, the loan limit may $636,150, giving you some leeway to borrow a more expensive mortgage before it’s considered a jumbo loan. If you do decide to take out a jumbo loan, you should know that they typically have higher interest rates. If you have a lower debt-to-income ratio and a higher credit score, a jumbo loan may be an option for you. Wells Fargo’s jumbo loans are available in fixed-rate or adjustable-rate loan options. New construction loan: This loan is designed for the purchase and construction of a new home. Unlike a traditional mortgage application, you may want to use an extended rate lock program to protect against interest-rate fluctuations during construction. Wells Fargo provides a Builder Best Extended Rate Lock program to lock in your interest rate from five to 24 months depending on what loan you pick. Once your home is built, a Certificate of Occupancy will be issued after a final inspection. Renovation loan: Wells Fargo’s Purchase & Renovate Loan helps you purchase a home and make renovations or repairs to it. The mortgage is available in fixed-rate or adjustable-rate conventional or FHA 203(k) loan options. Your loan amount is based on your home value after the planned improvements are made. Military mortgage: With the Military Mortgage Express program, Wells Fargo helps retired or active military members find mortgage financing that fits their specific needs. The military mortgage consultants are experienced in military culture and protocol. If you’re moving due to PCS or ETS-orders, you may qualify for relocation discounts. “yourFirstSM Mortgage” is a Wells Fargo product that allows buyers to purchase a home with a minimum down payment of 3% for a fixed-rate conventional mortgage of up to $424,100. While other similar products are available on the market, the one offered by Wells Fargo Mortgage doesn’t have specific income and counseling requirements. You will need mortgage insurance with this option. Wells Fargo also offers Union Plus mortgages for active or retired union members. With this mortgage option, you’ll get a $500 award card, and a mortgage assistance program for payment assistance in special hardships. Union plus provides interest-free mortgage assistance loans in case you suffer an unexpected loss of income. The first $1,000 of the loan or grant doesn’t have to be repaid. What Can You Do Online With Wells Fargo? Wells Fargo offers plenty of features on its website. 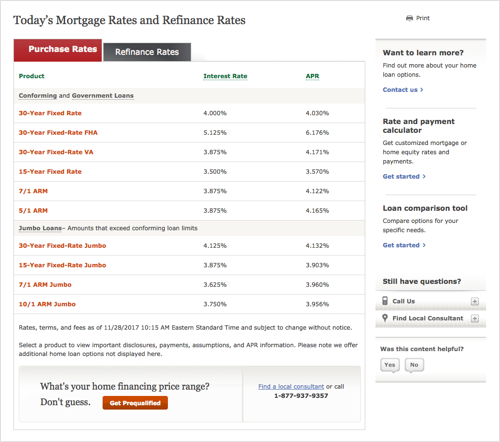 You can explore loan options, current interest rates and estimate payments with online tools. There are also videos on home lending topics for you to watch and learn. There are resources with all the documents you might need for a loan as well as home financing checklists so that you can track the details. You can start the prequalification process by filling out an online form, but you’ll have to speak with someone either in person or on the phone to complete the process. The same thing goes for applying for a mortgage itself. You can get the ball rolling online, but you’ll need to speak to a mortgage consultant to continue the process. If your loan is eligible, you can track all stages of the financing process through Wells Fargo’s yourLoanTrackerSM, an online application management system. Through this system you can upload required financial documents as well as review documents and disclosures from Wells Fargo. To keep you on track, you’ll receive email and text alerts as you reach important loan milestones. Would You Qualify for a Wells Fargo Mortgage? For a Wells Fargo mortgage, you’ll need a minimum credit score of 620 (with a down payment of 3% or more) to qualify for a conventional loan under the yourFirstSM Mortgage program. The program allows those without large down payments and who have poor to fair credit scores a chance at qualifying for a conventional mortgage. You’ll have to pay private mortgage insurance with this option, as it’s a riskier loan for Wells Fargo to make. Another option for those with poor or fair credit is a FHA loan. A down payment of 3.5% is required as well as FHA mortgage insurance premiums. Wells Fargo recommends speaking with one of their mortgage consultants to find out which option (FHA or yourFirstSM) will work best for you and your financial needs. For conventional loans, you’ll need a good or better credit score for a higher chance of approval. Other factors under review include your income, debt levels and down payment savings. Typically, a 20% down payment is the norm for a conventional loan, but you can put less money down if you’re willing to pay private mortgage insurance. Wells Fargo will also look at your debt-to-income ratio. If you’re carrying heavy debt, say from a combination of credit cards, student loans and a car note, you may not qualify for a mortgage even if you have a high salary. Wells Fargo considers 35% or less an ideal range for borrowers. From 36% - 49% is an “opportunity to improve.” They recommend lowering your debt-to-income ratio for better loan opportunities. And for 50% or more, Wells Fargo recommends taking action to lower debts as you won’t have much money to save or handle unforeseen expenses. To calculate your debt-to-income ratio, you add up your monthly bills such as alimony, child support, student, auto and credit card payments, and divide the total by your gross monthly income. The resulting number is your debt-to-income ratio. As outlined above, the lower the better. What’s the Process for Getting a Mortgage With Wells Fargo? With Wells Fargo, you can apply for a mortgage in person, online or over the phone. You’ll connect with a home mortgage consultant who will help you understand your loan choices. You’ll discuss home financing needs and how much you might be able to borrow. The consultant will help you complete an application online or in person. If your loan is eligible, you’ll receive an email invitation for yourLoanTracker. The dashboard on yourLoanTracker shows all the important milestones in your loan financing process. You can use the site to receive required disclosures, provide financial documents and check your loan’s progress. There’s a to-do list with tasks for you as well as tasks for Wells Fargo to complete. 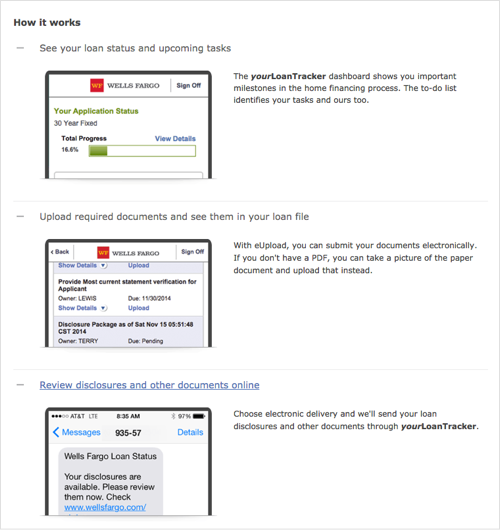 If you prefer using mail or fax, that’s also an option open to you with Wells Fargo. Once you review, sign and return all disclosures and financial documents, Wells Fargo will do an initial review. If you pass, you’ll receive a conditional approval letter pending the results of additional financial and property reviews. Wells Fargo will order an appraisal of the home to determine the current value. You’ll also have to submit and additional required documents (again, using yourLoanTracker, mail or fax). After Wells Fargo reviews all the necessary information and the result of the appraisal, they’ll determine whether you’re approved for the loan. If you’re approved, you’ll receive a commitment letter and a copy of the appraisal. Working together, you’ll schedule a closing date. You will need homeowners insurance to close on your loan, which Wells Fargo offers, but can also be provided by another bank of your choosing. Once Wells Fargo reviews your insurance (ensuring that you have enough), they’ll provide final disclosures and confirm the amount of money you’ll need to close. The final closing date will be set and you’ll receive a closing package with multiple documents to review and sign. Bring a cashier’s check to the closing for closing costs. The next thing to think about is how you’d like to make mortgage payments. It’s your choice whether you’d like to pay online, by mail or by phone. Wells Fargo is the top U.S. residential lender by volume and amount of home loan origination. With the wide variety of loan options and numerous locations available, Wells Fargo offers something for everyone. Another advantage of this company is the yourFirstSM Mortgage program. If you have a low credit score or small down payment, you may still qualify for a loan under this program. With the yourFirstSM Mortgage program, you can also qualify with income from rentals or from someone who lives with you but isn’t a co-signer. As one of the biggest four banks in the U.S., Wells Fargo offers other services such as home equity loans as well as home equity lines of credit. If you like to keep all your finances in one place and already are a customer of Wells Fargo, that’s another advantage to using this large company. As with any financial institution, there are pros and cons to using Wells Fargo for a mortgage. As always, you’ll need to do your own research to find what best fits your needs as a borrower. The annual percentage rate (APR) of a mortgage lender can provide some really strong insight into how much you can expect from its products in closing costs and other fees. More specifically, the difference between its interest rates and APRs are what you should keep an eye on. For some, preparing for a mortgage only goes so far before professional help is required. The SmartAsset financial advisor matching tool will set you up with three financial advisors in your area that are able and ready to help you manage your money following the introduction of a massive loan like a mortgage.